The framed flag was inscribed with a claim that it was “the personal flag of the first lord Amherst, Colonel of the Regiment from 1751 to 1757”, and was believed to have been flown at Quebec after its capture in 1759. The regiment in question was the 15th Regiment of Foot, later the East Yorkshire Regiment and the Prince of Wales’s Own Regiment of Yorkshire, which fought against the French during the Seven Years War in North America. Rod Allison, from Tadcaster firm Gallery 42, has created a special frame for the flag, to allow it to be taken to its new temporary home overseas. “The flag has been reframed and is heading to Germany to hang in the mess hall of the Prince of Wales’s Own Regiment stationed out there. 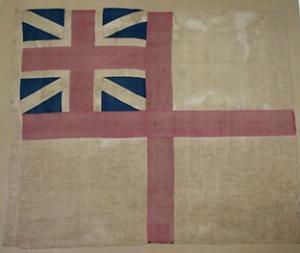 [...]"
The colour photo attached to the article shows a square white flag with a red cross and the Union Jack of the time in canton.